As it’s December 19 and officially less than a week ’til Christmas, I’m fully expecting everyone to have a beautifully decorated Christmas tree at home. If you don’t, go and buy one and decorate it before you continue reading this article. Go on, it’ll still be waiting for you when you come back. Anyway, I digress. One of the most magical parts of Christmas is decorating the tree, however this magic could be ruined if you spot a walnut-sized lump within the branches. That’s because the lump could contain uninvited guests in the form of hundreds of insect eggs, which could then hatch within your tree. The warning was first issued last year on social media, but has since resurfaced as people prepare for the upcoming festive season. 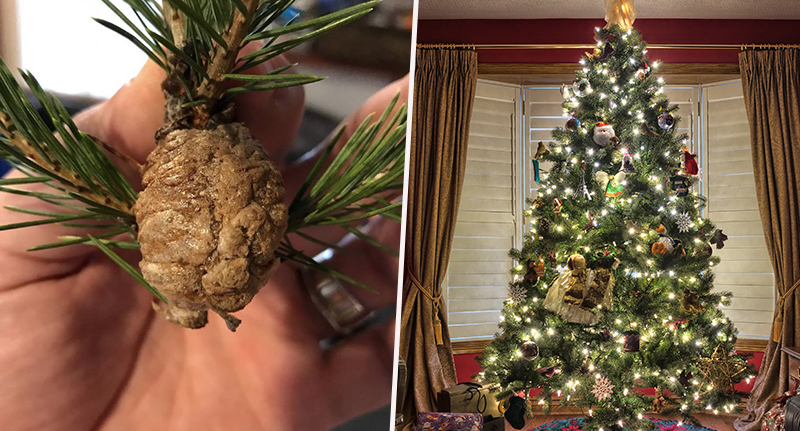 Posting to Facebook, Daniel Reed urged people to keep an eye out for the walnut-sized egg mass in their Christmas trees, telling them not to ‘fret’. If you happen to see a walnut sized/shaped egg mass, on your Christmas tree, don’t fret, clip the branch and put it in your garden. These are 100-200 preying mantis eggs! We had two egg masses on our tree this year. Don’t bring them inside they will hatch and starve! If left inside the tree, the praying mantis eggs will hatch because of the warm temperatures. However, they’ll not be able to survive because they will have nothing to feed off. People are therefore being urged to cut the mass out of the tree and place it in a shrub outside, where it’ll be able to hatch in the spring. Although I’d never heard of this before, the problem apparently surfaces each year, and many thanked Daniel for making them aware of it. The post currently has 3.6K comments (at the time of writing), and despite it being a year old, is continuing to attract a lot of attention. And it isn’t just praying mantis’ which live inside trees apparently, as another person shared their tale of finding a spider’s nest (eek!) in their tree.